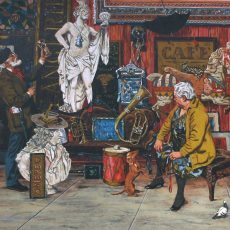 For many people, the unique appeal of a Bruce Bomberger lithograph is the feeling of deja vu it gives the viewer. As critic Barnaby Conrad recently enthused in Southwest Art magazine: "A Bomberger street scene is not just any street, but a particular one, observed and recorded by the artist with true appreciation and tender, loving attention . . . if his images don't take you back to places where you've been, they take you to places you'd love to have been." For Bomberger, such reactions are a special source of satisfaction. "Which is all the more meaningful," he explains, "because these scenes are disappearing rapidly. Sometimes, I don't even recognize a place between one visit and the next. They get modernized, redecorated or even torn down. So, I get a great deal of pleasure from recording them; it may be the only way they'll be retained, I feel almost an obligation to them, since looking at them gives me such pleasure." Beginning his painting career at the tender age of eight, Bruce Bomberger first studied art at the Berkeley (CA) School of Arts and Crafts, and at the Art Center School in Los Angeles. After selling his first major story illustration (at age 20) to Good Housekeeping, he soon developed into one of America's leading illustrators – a career he pursued for over 25 years. 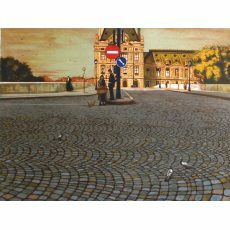 And today, beginning a veritable "second life" as a fine artist, he brings the same attention to detail and remarkable ability to capture the essence of an environment to his work. Bomberger's knowledge of his subject is extraordinary. 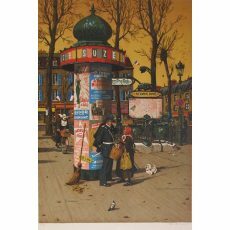 Bomberger's works include quirky touches, such as an incongruously placed nun, or a "Post No Bills" sign in French – on a wall papered with signs. As critic Conrad concludes, "Bomberger's works reveal his philosophy: that good realism is coming into its own again, and that an element of romance is inseparable from it. He feels that our need to continually have new avenues of human experience opened to us creates the demand for this romantic realm, a nostalgic focus on another time and another place." Says Bruce Bomberger, more simply: "I know many people like my pictures for the same reason that I create them – because they love the real places I'm depicting."